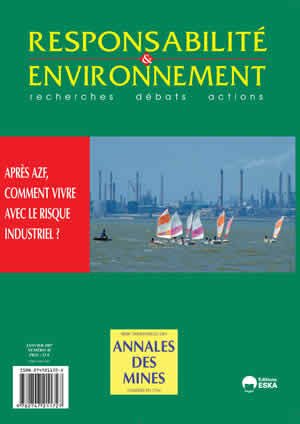 Responsabilité et Environnement - N° 46 - april 2007 - 1970, the invention of the environment? N° 45 - january 2007 - How to live with industrial risks after AZF ? The 2003 act on risk prevention: What is going to change from the plant operator’s viewpoint ? Did you say “citizen participation and information” ? Against the greenhouse effect: Let vehicle-owners pay for “bioheat” instead! This meeting was headed by Paul-Henri Bourrelier, a member of the French Association for Preventing Natural Catastrophes and chief mining engineer. Participants included: Gilles Strappazon (mayor of Saint-Barthélemy-de-Séchilienne), Philippe Huet (chief engineer in the Service of Water and Forests and a member of the General Inspection of the Environment), Yvette Veyret (professor of geography), Thierry Trouvé (delegate of Major Risks in the Ministry of Ecology and Sustainable Development) and Philippe Dumas (a member of the General Inspection of Finances).